Today is gray and stormy and comes complete with gale warnings. I knew I wouldn't be able to paint out in the wind and rain so I painted this morning from inside my truck with the window rolled down. For the most part it went surprisingly well. The main drawback was the light. I had my box as close to the open window as possible but it still changed what I saw on the palette. Most of the difference was in the sand area. When I got the painting home the sand looked very green. I did use yellow ochre with a bit of red and blue. I also had a hard time finding good light to take the picture in. I tried using the daylight bulbs as I had for one of my other paintings but that green color really popped out. I found a bit of natural light which made the colors closer with what I had put down but you can see every wrinkle and buckling here. I was further from the waves than I usually am. I was able to park along side of the road that goes in front of the beach and I had a pretty good view. I will probably use that as one of my go-to spots when I need to be sheltered to paint. I was surprised that the wind didn't blow through the open window so much but it sure rocked my Toyota Tundra truck quite a bit. Right as I was finishing up the rain got a bit heavy and started blowing inside the truck. The wind was blowing onshore today from the west and it whipped the foam off in chunks which would land on the wet sand and then blow up the beach. I tried to capture that but still need to tweak that a bit to make it more convincing. This is my 9th wave study! I am planning to do my 10th tomorrow. I have been pinning each study up to a bulletin board in my studio (a real one, not virtual even though, I am on Pinterest too). I decided I would post a picture of the bulletin board every ten paintings. It is really a good tool for me. I can start to see trends, where I need improvement, and what I need to adjust. My color palette is a good example of this. I have noticed the blues in my paintings all look purpley. Not surprising as my main blue I use is ultramarine. I also have pthalo blue but rarely use it. I decided to add cerulean blue and remove the pthalo blue from my palette to see what kind of difference it makes. I wouldn't mind adding an orange either. I do a lot of mixing from red, yellow, and blue. I am thinking of also adding sap green or viridian. I will make the changes and see what the next ten paintings look like. I have also decided to pick my favorite painting out of every batch of ten and do a studio version of it from the oil sketch and memory. These are what I will start selling. If all goes well, I will have the first bulletin board picture to share this weekend! One final announcement. 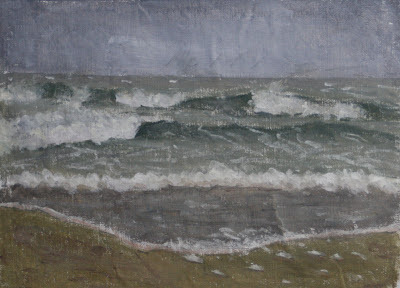 I am happy to say one of my small paintings entered into the DailyPaintworks Hurricane Sandy Relief fund sold! It was with tremendous pleasure I was able to donate 100% of the proceeds to Guardians of Rescue. There is one more painting left for sale and you can view it by clicking on the DailyPaintworks widgets on the upper right corner of my blog. The painting in the auction is "Pumpkin Sage". "Sweet Tea" has gone to my friend Audene Jay where it will be hung in along with her own beautiful art. I lovely honor for me. How exciting! Congrats on the painting sale. I can hardly wait to see the 10 waves studies side by side. Is there really such a thing as an average storm when you have all that beautiful wind and wave? 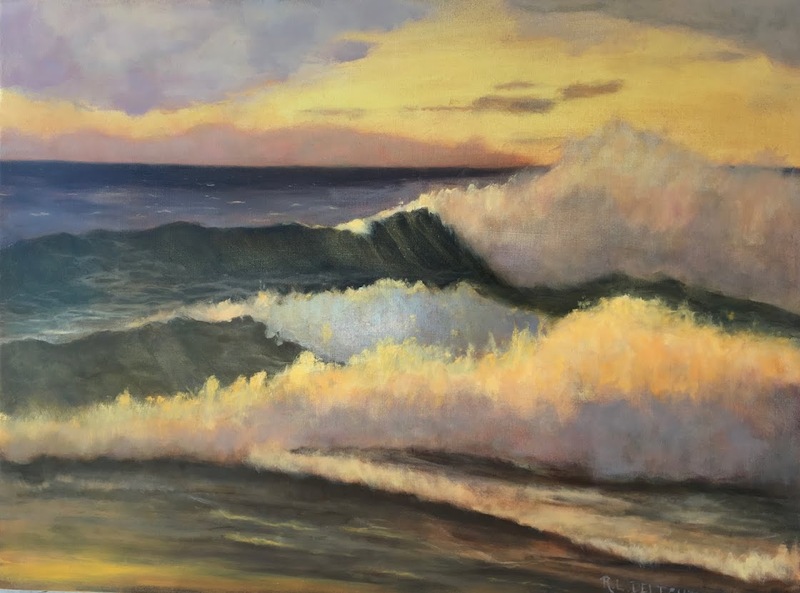 I love your wave studies Renee! It is so fascinating to see them day by day and hear about the vicissitudes of painting them. A rocking Toyota Tundra speaks of heavy winds indeed. This one actually looks like it was painted through a rain spattered window, although you say it wasn't. I'll be looking forward to the changes your palette adjustments make. Congratulations on your sale and your donation! Dana, I roll the window down so I don't have the glass distorting the color in any way. That means when the wind suddenly comes howling in with torrential rain as it did today, it starts pouring into the vehicle and I have to head home. Thanks again for the lovely comments. I am having a heck of a lot of fun with these.